Thought that nothing remained to add to the 2014 Mustang Trail Race scrapbook. Just written my wrap up post and alerted the other group members to it when Italian yogi Tite Togni asked me if my description of the experience as being blown away meant that the wind had been a Leifmotiv. How could I forget the wind?! It was gone from my memory as soon as I had left, while it had dominated my time in Mustang. The first couple of days even with an overpowering fierceness that literally blew some of us off their feet, who were out on exposed passes later during the day. How could that be? And what a marvel that wind is, rushing through this gap in the main range of the Himalaya, from the Tibetan plateau down to the Gangetic plain, fired up by the temperature difference. What a way to experience the environment at a geological scale! And touch seems so much more direct than seeing. But I, we? are primarily visual beings, so the wonder of walking on the ancient Tethys seabed, as evidenced by the fossils we came across, immediately above Jomosom, and later in Upper Mustang, had registered, but the wind, that had nearly knocked me off my feet? It took Tite’s reminder to consciously celebrate its (admittedly somewhat threatening) magnificence. Let me pay homage to that wind with a short video. It seems to have gone viral, and I think I understand why. It’s about a guy who can sing, and two others who are much more switched on than I am, cause they know when something special is happening, and show the rest of us what living in the moment means. 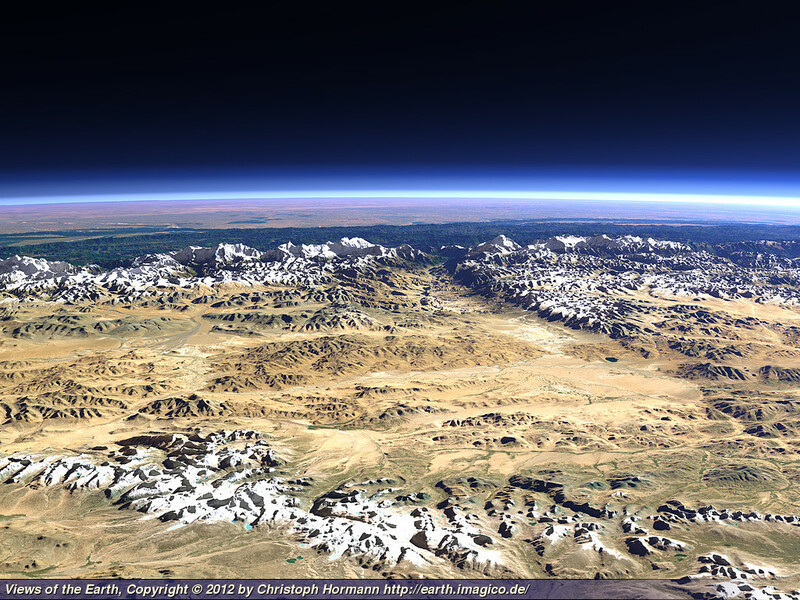 I love the site that hosts these beautiful views of the earth that I took the above picture from. Check out his list: plenty of amazing perspectives to be found. 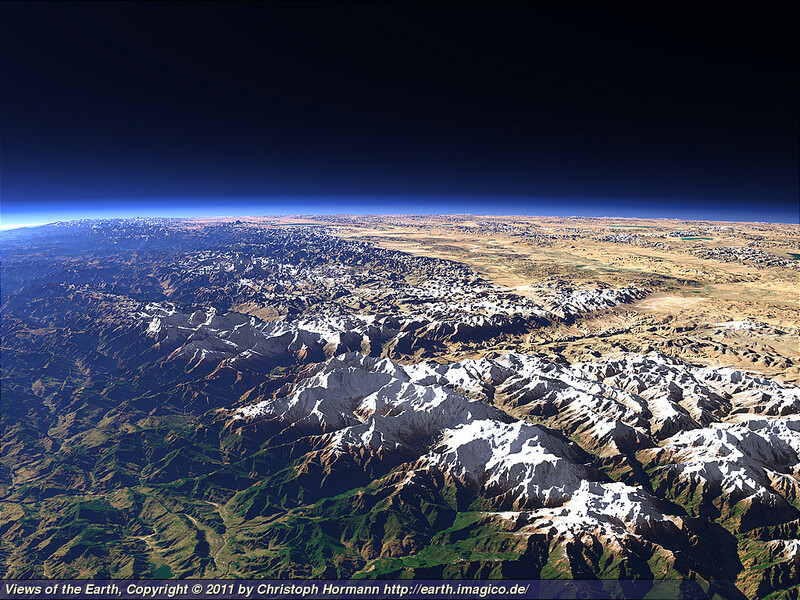 The region of Mustang is located north of the Kali Gandaki Gorge at the border between central Nepal and Tibet. 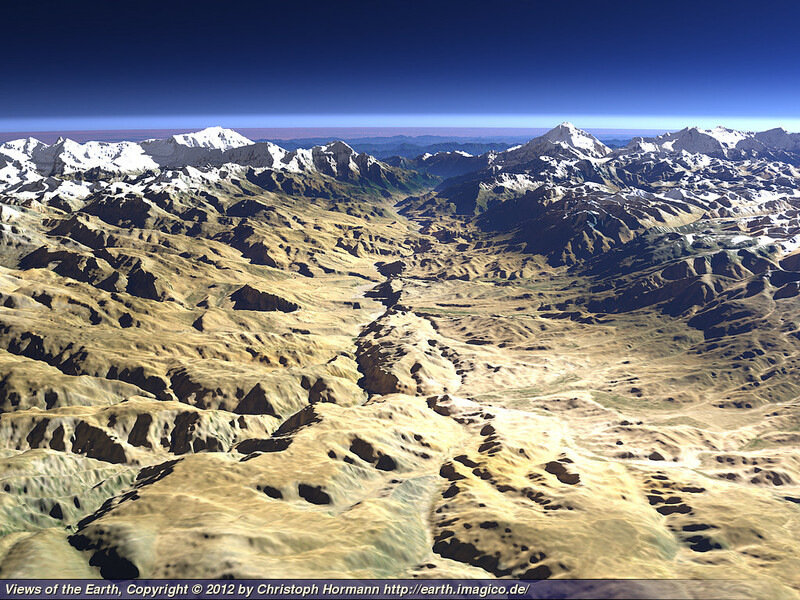 The gorge forms the lowest crossing of the main Himalaya ridge and can be seen in the center of this view between the Annapurna massif on the left and the Dhaulagiri on the right. In the background the view reaches to the Ganges plain in northern India. In the foreground the Yarlung Tsangpo River (the upper part of the Brahmaputra) crosses from right to left behind the Gangdise with the Lunpo Gangri (7095m) on the left. This entry was posted in Mustang Trail Race 2014, natural sciences, psychology and tagged Christoph Hormann, geological scale, jam session, Kali Gandaki, Mustang Trail Race, sensual experience. Bookmark the permalink.